Braven Offroad looks like a relatively new UTV tire and now wheel company, but it isn’t. Braven Offroad is part of Tire Mart, and Tire Mart has been in business for 77 years and owned by the same U.S. family. Interestingly, Braven starts the information about its new Berserker UTV tire by saying that there are “hundreds of tires to choose from” in the UTV market. As far as Braven goes, the only tire it sells at the moment is the Berserker in 30- and 32-inch sizes for either 14- or 15-inch rims. By the time you read this, there should be 28-inch models for 12-, 14-, and 15-inch rims, with 34-inch tires coming soon. 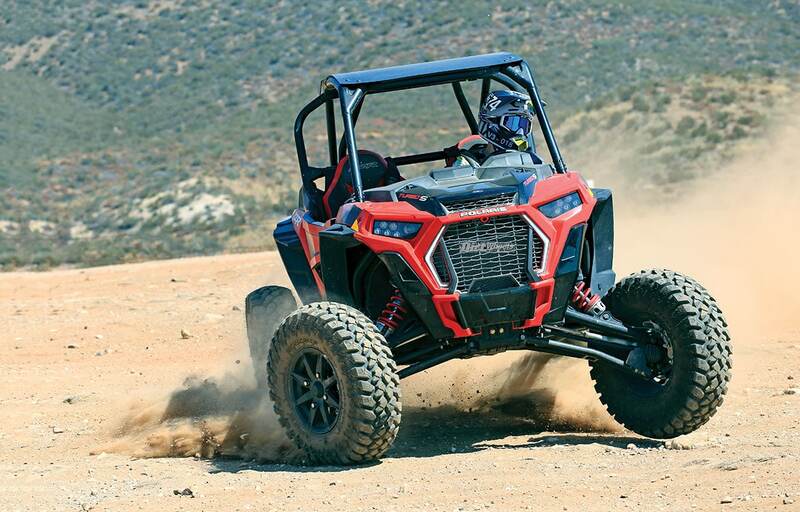 Our test tires were 30x10R15 units priced at $163.29 that we mounted to the stock Polaris wheels on our RZR Turbo S. The Turbo S comes stock with 15-inch wheels and 32-inch ITP Coyote tires. The Coyotes are eight-ply-rated, and ITP claims a full 32-inch mounted height. It claims a 44-pound weight, but our tires with 600 miles weighed 43.60 pounds. The Braven 30-inch tires look very tall, and the specs say they are 30.5 inches. Ours weighed 42.95 pounds. The spanking-new Braven Berserker Cross-X UTV tire looks good, and it has all the features that you expect from a desert tire. We mounted the four tires ourselves in roughly 30 minutes with two of us working. They mounted easily and seated on the rims just fine. Tire pressures have remained steady as well. We started at 15 psi, but for our rocky local riding area, we soon dropped to 12 psi or even lower. Traction was fine at 15 psi, but traction and ride both improved with the drop in air pressure. The DOT-rated tires didn’t wallow or roll at all with the lower air pressure. After two days of driving on rocks and packed surfaces with air temps of 100-plus degrees, the tires showed only microscopic rounding on the front edges of the tread blocks of the rear tires. The fronts look new. We never worried about flats at all, and we didn’t experience any. 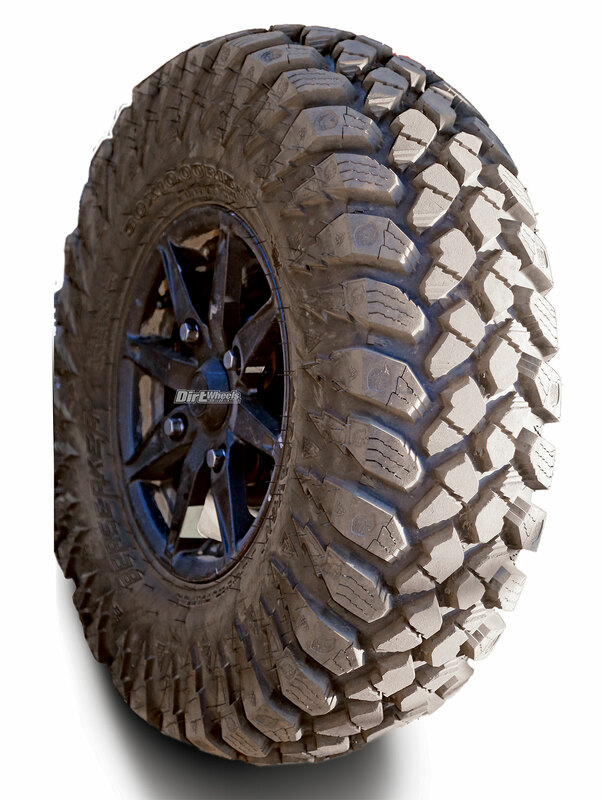 Like any desert-oriented tire, it gets through deep sand fine but works far better on hard surfaces and rocky terrain. Suspension action with the Berserker has a crisp feeling where you feel more of the terrain surface than with the stock tires. Going even lower with air pressure helped. Perhaps changing the construction for the road-legal DOT rating adds a different dynamic. We aren’t able to run on pavement in California, but we believe this tire would work well and last. If you want a long-lasting tire that can handle the desert, the Braven Berserker Cross-X will work for you. For more information, visit www.bravenoffroad.com or call (800) 645-2006.